Leo! Oh Leo. Whether he's on the bow of a ship or flying through my dreams, everything he does is dreamy. And now he's starting a Formula E team with Venturi. Formula E, which certainly won't be vaporware or go belly up soon after starting, is the FIA's vision for an all-electric, open wheel race series. Teams have been joining, with IndyCar orgs like Andretti Autosport pledging to join in. 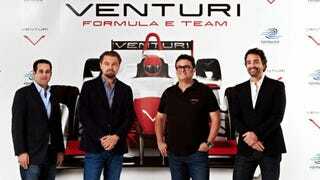 But now, motorsport icon and international heartthrob Leonardo DiCaprio is adding some much needed gravitas to Formula E by entering a team in a partnership with Venturi. The team is based on Monaco, because of course it is. His passion for motorsport is obvious, which makes this effort all the more exciting. I bet we see him on the sidelines at every Formula E race.